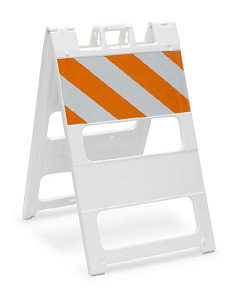 A-Frame barricades are made of rigid impact resistant polyethylene and its' legs are sand fillable for ballasting, stackable for storage and transportation. Each A-Frame leg can be used with the I-Beam Rails, Phoenix Plastic Rails, or lumber. The Phoenix Type III Barricade from TrafFix Devices is lightweight making it easy for a single worker to setup or breakdown. It comes complete with (2) 72" steel or plastic pre-drilled uprights which attach to (2) 40 lb. recycled rubber and steel bases. The ADA Wall is used to create hand guided safe passages through workzones that meet ADA requirements and is MASH Tested, Passed, and Eligible as TL-3 Longitudinal Channelizing Device. The TrafFix ADA Wall is made of UV stabilized, high density polyethylene. HD 700 Series High Impact Surface Mount Delineator Posts are the only sensible choice for hi-traffic, hi-impact locations. Using the same color impregnated polycarbonate extrusion and flexible hinge as the virtually indestructible FlexStake HD surface mounted SM's are still standing after 8 years of hard road use. Minimum of 18" wide throughout its 36" height, regardless of orientation. 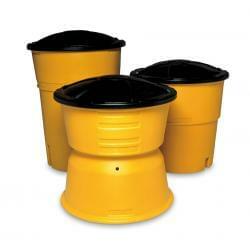 Tapered design allows stacking with or without barricade lights for easy handling and storage. Drum and base remain "snapped together" until impacted or separated for transportation and storage. Gentle curves throughout drum eliminate sharp edges or corners that crack and break when impacted. Built-in carrying and dragging handle.